I like Turing and he was born in 23rd of June 1912 so he would be nearly hundred now. He was an interesting guy so at some point I drew a picture of him not sure why now. Something not everyone knows about Alan is that he was, in reversal of math geek stereotypes, a distance runner. 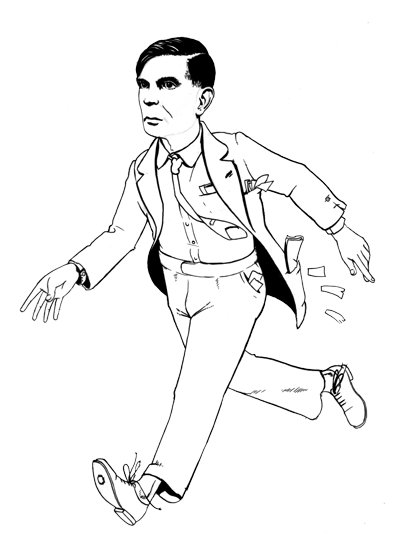 Running from meetings when he worked outside London after the end of the second world war. Not going to rerun his life history you can read about that everywhere. You can even search a multicoloured search engine you might of heard of for ‘Turing birthday’ and you get a result. I especially like the stories about him trying to teach his computer in Manchester to write love letters. Also the story about him filling in his home guard registration form and his logical response to the tick here to indicate that you understand you are under military discipline. Don’t tick the box how could you gain from it? The Secret Life of Bletchley Park good idea of what went on at Bletchley Park reminder that many, many people contributed to breaking codes. Bletchley park its pretty neat especially if you a bit of a geek (computers the size of small rooms!) but interesting historically too. I went on bank holiday for William Kates wedding avoided it nearly completely, Result!